Want serious knockout power in the ring? Sure you’ll need to put in long hours in the gym, but even professional fighters know it takes more than that. Just ask Floyd Mayweather Jr. – he’s obsessed with using the best boxing gloves. It’s because the right equipment can make the difference between a knockout and a 12 round decision. And we both know, you never want to leave your fate in the hands of the judges. So what boxing gloves should you put in your gym bag? We asked a few experts at our local boxing gyms to weigh in on the best boxing gloves for training and sparring. Get involved in the discussion: Vote for your favorite brand or add your own review below. I’ve been writing for many years now and take pride in bringing the facts to my readers from a unique angle. That’s why I was a little hesitant to put Winning brand training gloves (see price) at the top of my list. You see, they come in at the top of almost everyone’s list of the best boxing gloves. But from my experience and research, they are one of the best rated brands for a reason. Winning is a Japanese company known for their quality and craftsmanship. This is evident in the long list of customer reviews that claim their gloves still look brand new even after 2 years of daily use. You can’t find that kind of quality from other brands. Not only do the materials hold up to sustained abuse, but they also provide excellent support for your hands and wrists. Although the Winning brand is typically more expensive compared to other training gloves, the price is worth it. If you decide to buy a cheap pair of gloves to get started you could be putting the health of your hands and wrists at risk. Don’t make the same mistake thousands of other new boxers have made by buying cheap boxing gloves. Get started on the right foot with a pair of Winning brand gloves. In contrast to Winning, Hayabusa boxing gloves (check price) have much more flash. But the good news is that they live up to the hype. On the surface these gloves are covered in logos and are available in a wide range of colors. It’s common for new boxers to get sucked into the looks of a glove instead of their performance. However, Hayabusa gloves have both great appearance and performance characteristics that are unmatched. Simply put, Hayabusa gloves provide great support and are constructed with high-quality materials. That means you’ll be able to use them in the gym for years instead of just a few months. I can’t post a list of the top boxing gloves without mentioning Cleto Reyes. Somewhat controversial, these gloves are both loved and hated by boxers around the world. Cleto Reyes boxing gloves (check price) are handmade in Mexico and require a significant amount of time to be broken in. However, once they are softened up, the quality and performance is unparalleled. The main reason these gloves are not universally liked is because of their thin padding. 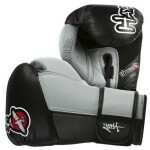 If you prefer extra padding while you are training or sparring, these gloves might not be for you. 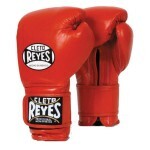 However, if you enjoy getting more feedback from your punches, the Cleto Reyes Training Gloves may be a perfect fit. When putting these gloves on for the first time you’ll notice they have extra wrist support. Having additional support can make some fighters feel limited in their movements. So keep this in mind when selecting the right glove for your fighting style. If it helps your decision making process, I should also point out Cleto Reyes gloves are worn by top fighters such as Manny Pacquiao. Depending on your training style and competition level, you’ll most likely need two pairs of gloves. 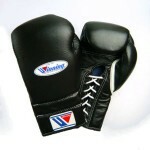 The first is a set of sparring or training gloves. These are traditionally heavier gloves (12 oz and up) with more padding and support to keep your hands and wrists healthy. The second set of gloves you’ll need are competition gloves (8 or 10 oz). If you plan on going pro, these are the gloves you’ll wear as you work your way up the championship standings. Then, they’ll raise your glove in the air as you become the next Heavyweight Champion. Before we get too far ahead of ourselves, let’s start with training gloves. One of the biggest factors to consider when choosing the right boxing gloves is weight. The more you weigh, the heavier the glove you’ll need. That’s because heavier fighters typically have more strength and need more padding to protect their hands and wrists. Having extra padding also helps protect you and your sparring partner from getting knocked out during a training session.